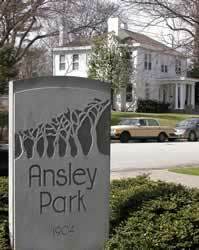 Development of Ansley Park began in 1904 when a group of businessmen led by Edwin P. Ansley purchased a large plot of land north of the city, creating Atlanta’s first northern suburb. Today, Ansley Park is no longer a suburb but an oasis of grand homes and green spaces set against the backdrop of modern skyscrapers in nearby Midtown. The neighborhood is revered for the architectural significance of its homes and inspired land plan, which incorporates wide parkways and majestic parks (Winn and McClatchey). Ansley Park is home to Ansley Golf Club (1912), which has been ranked among the top nine-hole courses in the United States by Sports Illustrated magazine. Many Ansley Park residents are also members of the nearby Piedmont Driving Club (1887), one of the most prestigious private country clubs in the Southeast.